This is LeBron James' world, and the rest of us are just living in it. When you reach a certain level of NBA stardom, you can essentially do whatever you want. But when you’re LeBron James, there’s no qualification necessary: You do as you please. According to an in-depth report on James’ first season back with the Cleveland Cavaliers from ESPN.com, the ability to control operations both on and off the court was a big reason James returned to the Cavs prior to the 2014-15 season. Previous reports have indicated that James was comfortable taking over play-calling duties from coach David Blatt and reaching out to other free agents as a recruiter, information that’s further detailed in this report. On Dec. 30, suffering through knee and back pain that has hampered him on the court for weeks, James unilaterally makes the call to sit. Says Windhorst on the B.S. 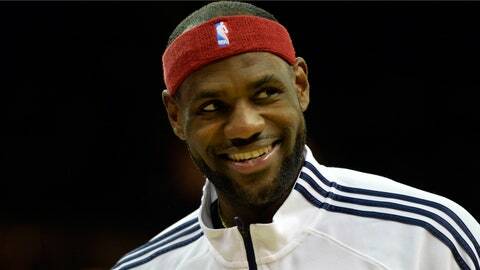 Report: “LeBron just decided, 'I'm not gonna play.' Like, at the last minute, he told them, 'I'm not playing.' Didn't even come out to the bench, just sat in the back, didn't come out.” The Cavs are stunned, but they acquiesce to the decision and agree to two weeks' rest. The rest served James and the Cavs well; he came back at full strength and was able to lead a depleted Cleveland squad to the NBA Finals. Still, it couldn’t have been easy for the team to adjust as such on the fly. The report goes on to detail James’ hand in the initial trade that brought Kevin Love to Cleveland and Love’s subsequent five-year contract, as well as how James’ belief in J.R. Smith enabled general manager David Griffin to make the move to acquire Smith and Iman Shumpert from the New York Knicks midseason. James is a player unlike any other, and he has the power to match.